Allows you to dismantle crafted items by pressing a configurable key. -fixed bug: mod was trying to dismantle even when menus were open. -fixed bug: the wrong amount of items was dropped if the inventory of the player was full. -tweak: changed default value of "loss" to 49 so you get at least one item of every item in the recipe. Press a configurable key (default 'R') to dismantle the selected item stack in your inventory. Remove the folder of this mod. 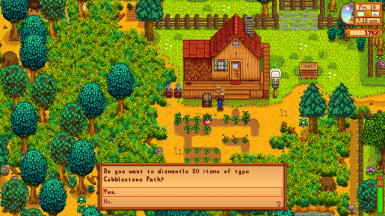 Tested with Stardew Valley 1.3.36 on Linux and Windows. If you like this mod you might also like my mod Interaction Tweaks.